When I took a photo of my stash a couple of weeks ago, I noticed that my cabinet was very heavy on teals, aquas, and grays. When I'm out shopping for fabric, I am drawn to those colors and tend to purchase them more often as stash builders (obviously), even as I show discipline with fabrics in other hues. Of course I know this about myself, but actually seeing the evidence in a picture really made me realize that I should stop stashing those colors for awhile, and put some of those yummy fabrics to good use. I haven't done a two-color quilt in a little while, and thought a classic Bowtie pattern would be a perfect way to tame those sections of my stash. Before I go any further, let me apologize for not making a post during the process of this quilt. I think it's important to do that, since we all know that quilts don't just magically appear out of thin air, but we've had some rainy days lately, and the indoor photos I took didn't capture it well at all. This one did go together rather quickly as well. Because I love aqua and gray, I had some larger cuts of most of the fabrics in this quilt, and I used up all of the leftovers on the back. The quilting is done in Aurifil 50 wt. #5006 (Light Turquoise), and it adds another layer of sweetness to this one. And I decided to bind it in one of the darkest teal prints. The colors in this quilt remind me of a backyard oasis, with glistening water surrounded by stone, so I've decided to name it Poolside. I'm loving the way the modern prints set off the traditional Bowtie block, and I especially love that I used up 10 aquas and 10 grays from my cabinet. Those fabrics all look so lovely together, it just makes sense you'd be growing that bit of stash all together. Well done. I love this quilt! Those colors, ohhhhh! Funny, you realized you had a lot of teals and aqua...I realized I don't have many! I started a QAL recently and realized that I have to stop buying orange and pink...and start buying more aqua/teal! I love everything about this quilt. 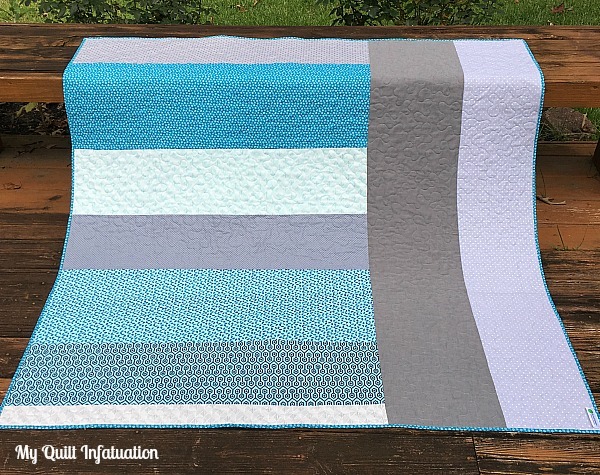 Teal and aqua and gray is such a lovely color combination! That pieced backing is great, and the binding ... perfect! I noticed that my fabric stash also gravitates towards a certain type ... rainbows. I could never resist a rainbow bundle. Great name! Your quilt reminds me of the pattern the sun makes on the bottom of the pool. Love your choice of colors and pattern. What a cool way to say good-bye to summer. So stunning and love your fabric combo ans as always your back caught my eye! Lovely quilt. The color combo is great! I could dive right in! Gorgeous quilt and pattern! It reminds me of the beautiful ocean! Thank you for sharing! 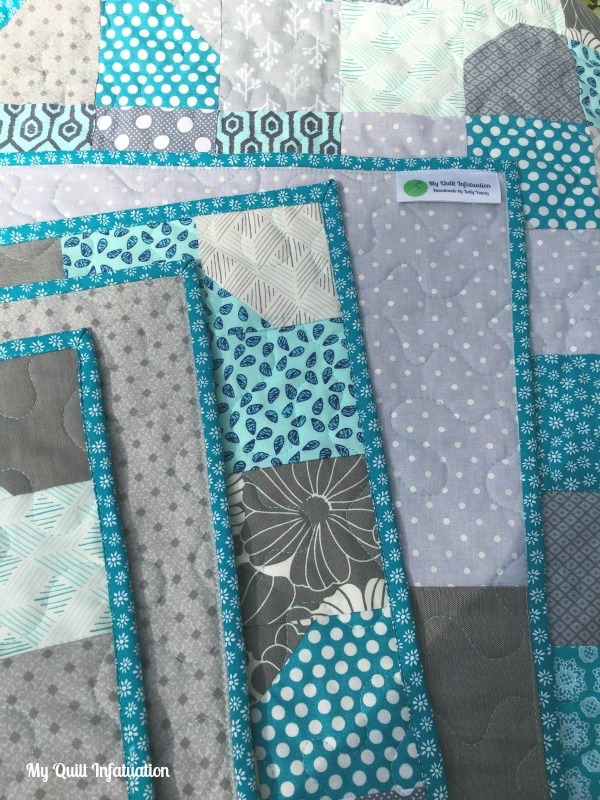 Gotta LOVE a stash quilt!! (Particularly one in this color combo.) Enjoy!! Love love this one . . . but then I love all your quilts. I've been leaning toward simple color schemes myself lately with greens being the current focus. 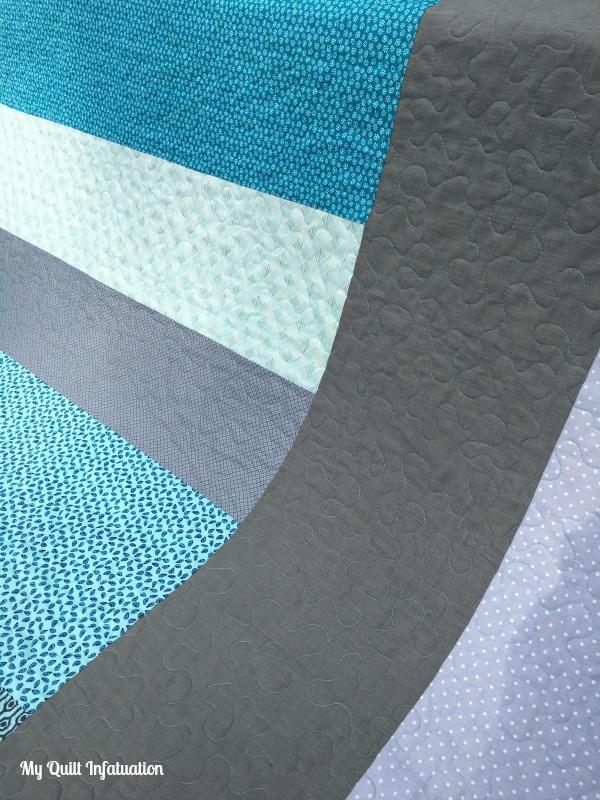 I've also been thinking about a bow tie quilt too although I don't have plans for one at the moment. Hmmm we must think alike. This is a great design and such a great use of your scraps. The quilt turned out beautifully. 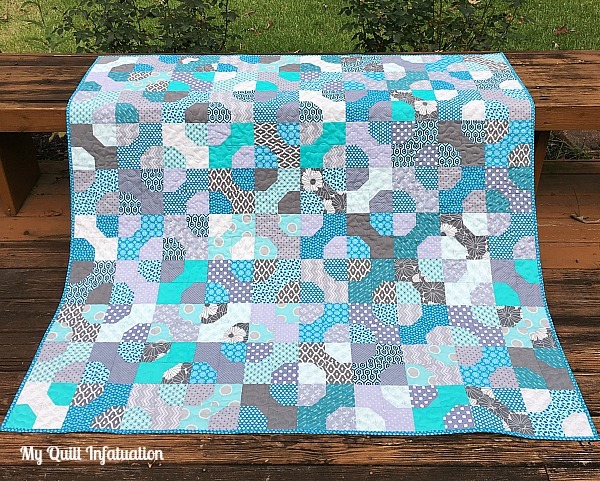 This is a gorgeous quilt Kelly! I love the blue grey tones together. Very soothing Kelly. I totally love grey now...have always been a turqoise lover and this is such a cool combo. Thanks for sharing! Such a beautiful quilt! I think it will make you smile every time you use it or see it. Thanks for sharing your work. Beautiful finish. The name pretty much nails the feeling you get from this quilt. You can almost see the ripples in the water as your eyes move over the quilt.